This is another model created in the early 1980's for my freelance HOn3 layout. The design is from a variety of sources, but primarily from trips to the Southern Pacific Lenzen Roundhouse in San Jose, CA. 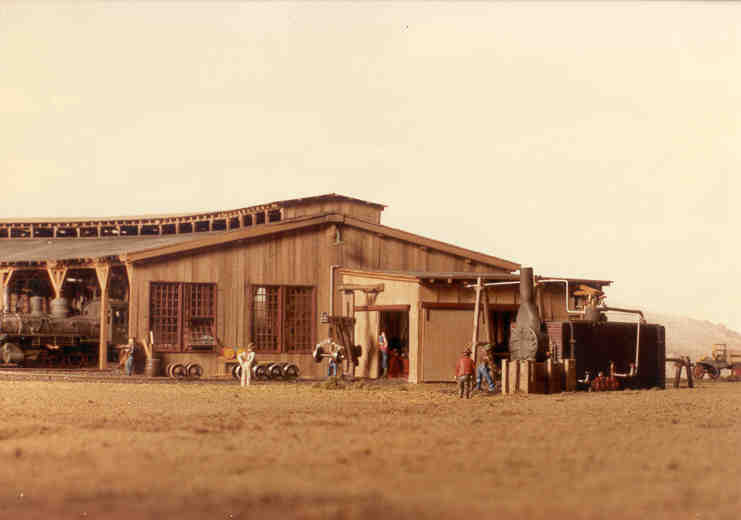 That structure has now been dismantled, but is slated to be reassembled at the new Santa Clara County Railroad Museum. Other sources include the Model Railroader Cyclopedia Volume 1, published by Kalmbach. This was another eight-month project. All construction was board-by-board to get the subtle color differences only available with that method. Where the Lenzen Roundhouse was constructed with brick walls, I chose to use wood because I was after a more backwoods feel. The attached machine shop uses Campbell's corrugated siding cut to scale-sized sheets and individually applied. An external boiler feeds a horizontal steam engine, which powers the overhead belt drive of the machine shop. 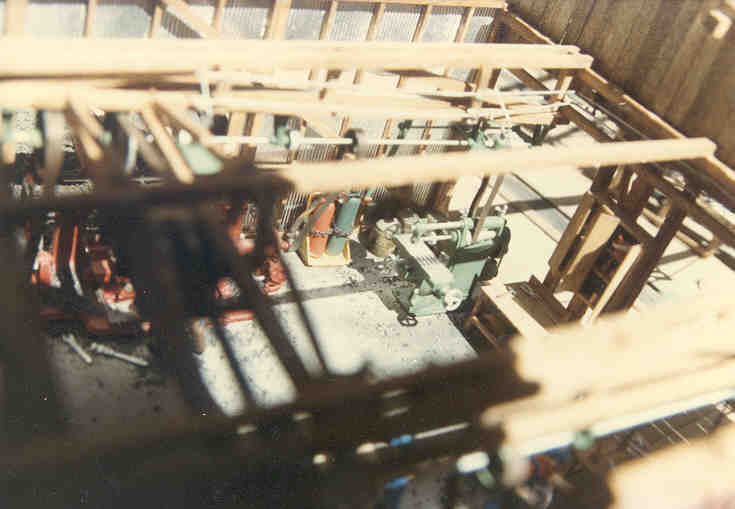 Many commercial castings were used, including the wheel crane, boiler, steam engine, windows, and the machines themselves, as well as a variety of tools scattered around. 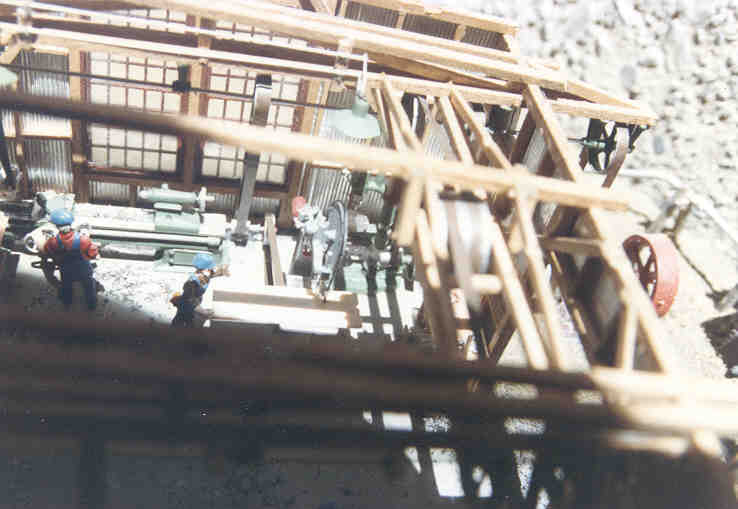 This photo was taken after the roundhouse had been installed in the layout. Full working interior and exterior lighting was installed using 1.5v grain-o-wheat bulbs. 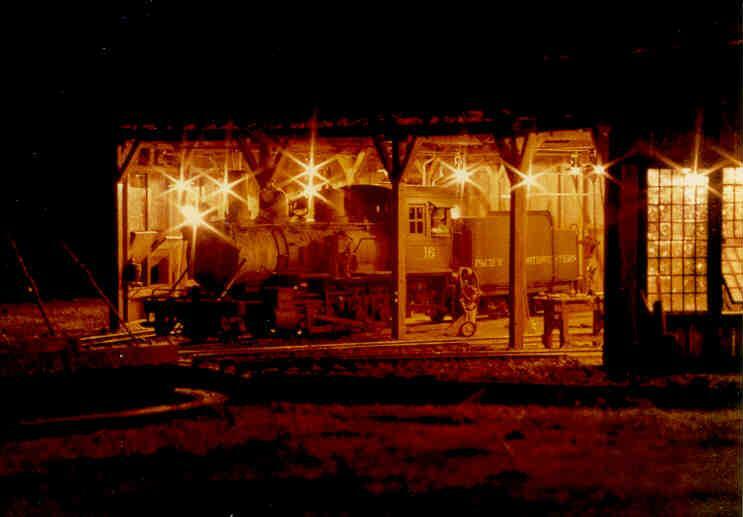 The coaling tower is a modified Campbell's kit. 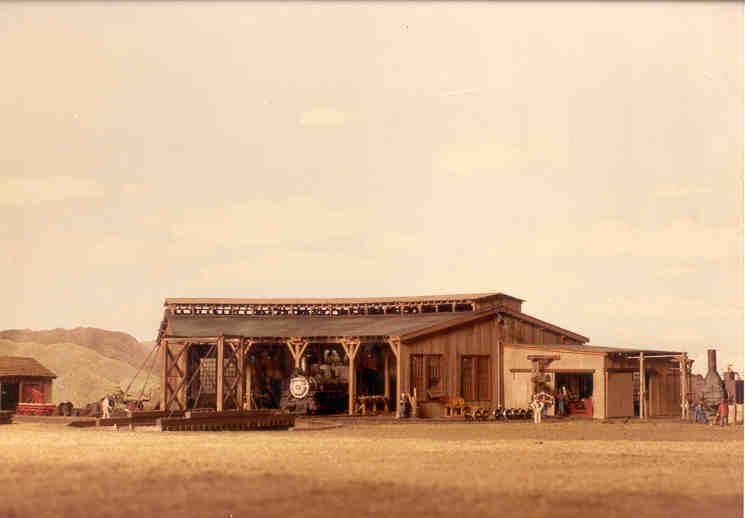 The handcar shed was also a commercial kit, as was the turntable. P&NW No. 16 sits ready for her early morning freight run. 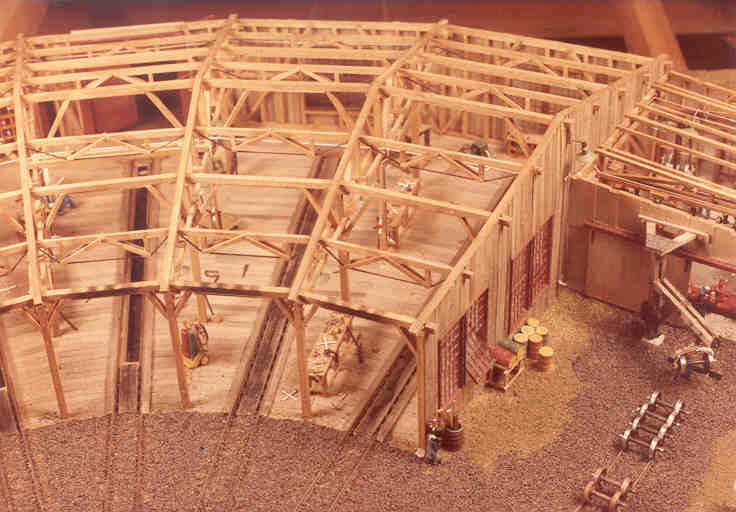 The roof bracing was as close to that employed on the Lenzen Roundhouse as I could duplicate. Two stalls have inspection pits, and all are fitted with full steam and water plumbing. Work benches are littered with tools. An overall shot of the machine shop interior. It is equipped with a lathe, drill press, band saw, end mill, and wheel-turning lathe. All machines are belt-driven from the overhead system. 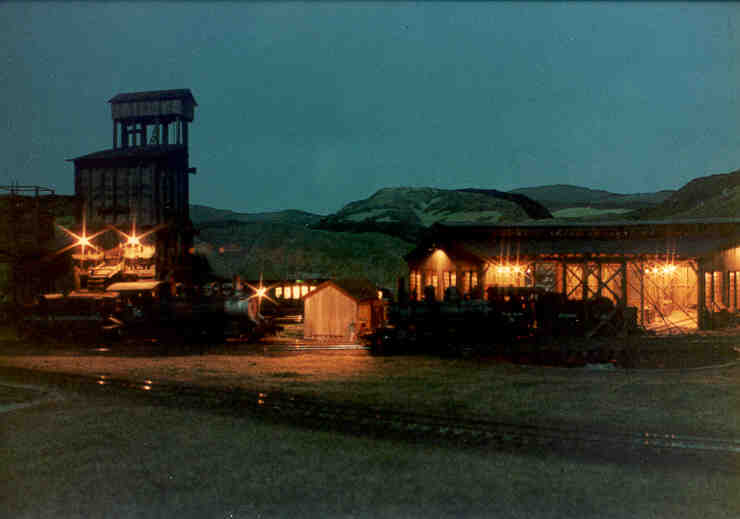 The external horizontal steam engine is visible at bottom-right. This view looks back into the roundhouse. Metal chips are scattered on the floor around the end mill (center), lathe, and wheel-turning lathe. 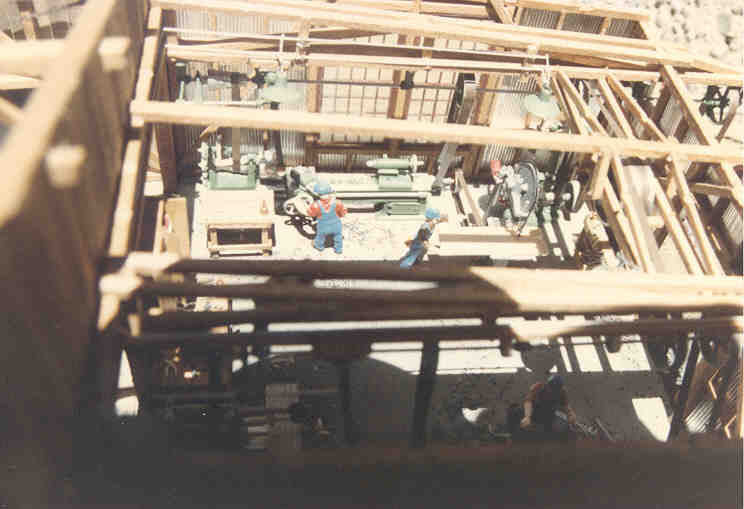 Looking towards the back wall, the lathe and band saw are visible. Power transfer pulleys built into the roof at right get power from the back wall to the front. 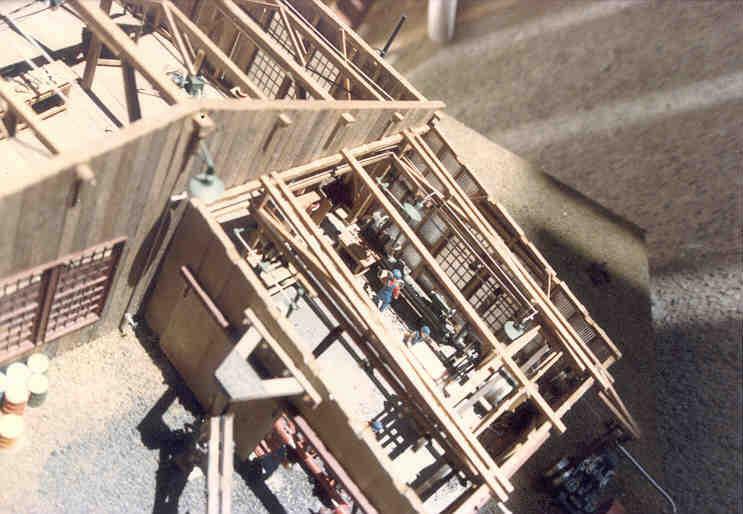 The shop of the Sierra Railway in Jamestown provided inspiration and technical details. The wheel-turning lathe operator is visible at bottom. A sheet of plywood is being cut on the band saw. All light bulbs throughout the structure were super-glued into brass shades. The leads were then stripped, tinned, and formed into brackets. These were then soldered to brass rod which actually supplied the power. When painted silver, the brass rod simulates conduit. A total of 30 lights are installed.